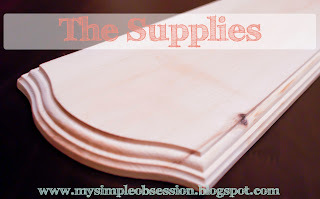 If you love the sign but don't know or how to do it yourself, I make and sell them in my shop. Just Click the link below to check it out! 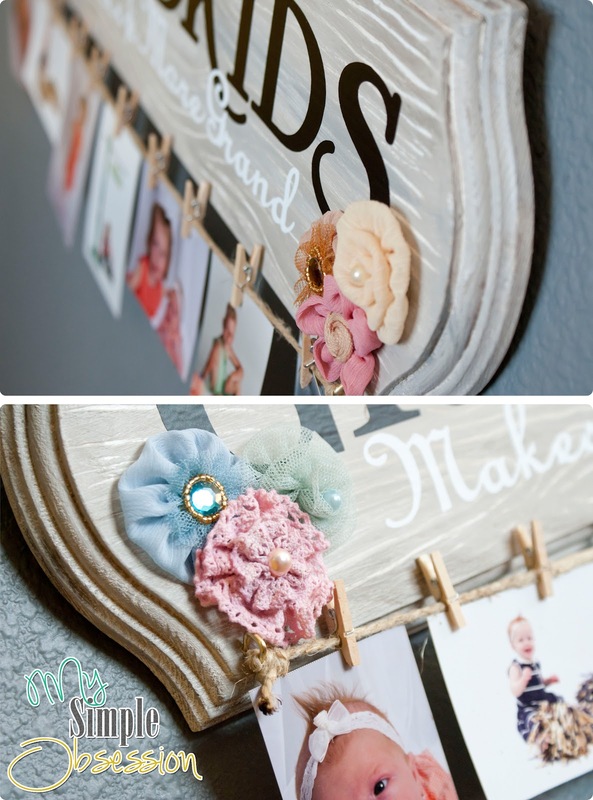 Now you can hot glue your floral decor or whatever you choose to make your sign stand out. I bought a set at Michaels using a coupon I had. 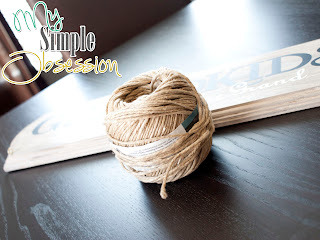 It came with a set of six fabric flowers so I made two clusters of 3. once your hot glue has settled take your clothes pins, However many you decided on and clip them to the twine. You will need your staple gun and burlap ribbon. Take your ribbon and cut two equally length pieces. Take one piece and roll it twice about a half inch each roll. Staple it facing down at an angle. ** Very IMPORTANT ** Make sure your ribbon is placed at an angle! If you staple at a 90 degree angle it will not look right when you go to tie the two pieces together in the middle. Use the picture above for reference. Once you've stapled the two pieces of ribbon, bring them to a center and tie a bow. 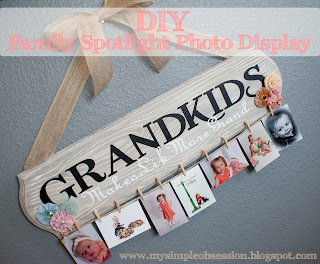 I plan on making a family one for our house so I will take some photos of it and post them when I get around to making it. Please let me know what you think and don't be scared to show me all of the ones you guys create! Until next time.... Keep creating, living, and obsessing! This is darling :) Thanks so much for sharing at Live Laugh Rowe! Hugs. 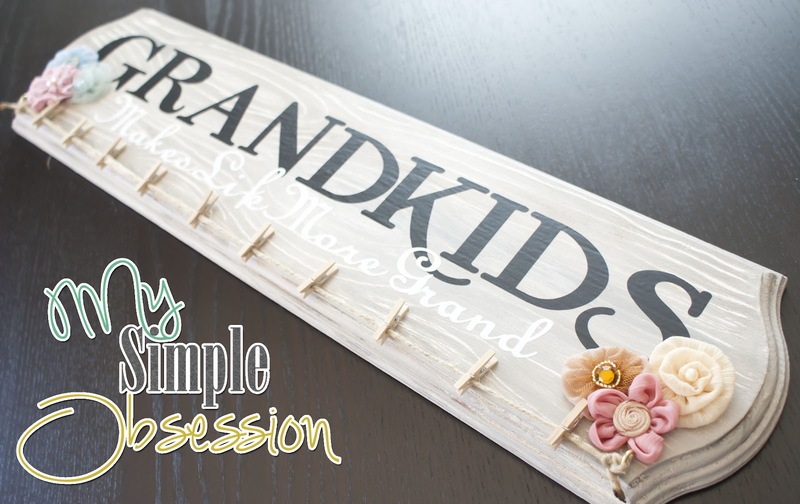 I will be featuring this project later today on Tuesday's Tidbits @ Naptime Delights. Thanks for linking up! Thank you! And yes you can purchase them in my etsy shop. Here is the listing. You can also select the Etsy tab at the top of the blog to check out what is for sale. :) Thanks again for the Kind words. How big is the plaque? I loved this. In fact this is my grandparents Christmas gift. However, I painted it all by hand. This is so cute. 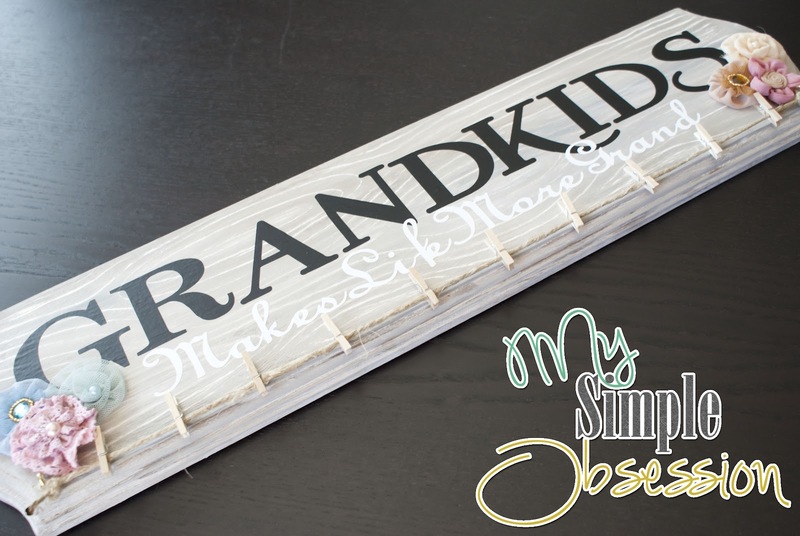 How large did you cut your font for both the Grandkids and make life more grand? I am not crafty and am wondering what "heavy dry brushing" is? Hi Christie. Hope this picture helps. This is an example of dry brush techniques. left is heavy and right is light. The letters are done in vinyl. You can use transfer tape to apply them. How did you get your bow so pretty? Mine looks awful, lol! :) It actually took me a bit. But the trick is to flip the sign backwards and tie it. Works for me. :) mine use to be upside down. I've also made my own slightly altered version for mum for Christmas so thank you. I am a senior citizen on limited income and could never afford one of those letter making machines and don't know anyone with one. There are so many projects that use them and no alternative method if you don't have one other than painting which I am not good at either. It would make a lovely gift for my sister. You can also ordering the vinyl sayings on Etsy. It's pretty affordable. My mom would love this! I am not crafty but your instructions are great. Can I ask what size plaque this is? thank you so very much for the detailed instructions. This was exactly what I was looking for! Again thank you thank you! 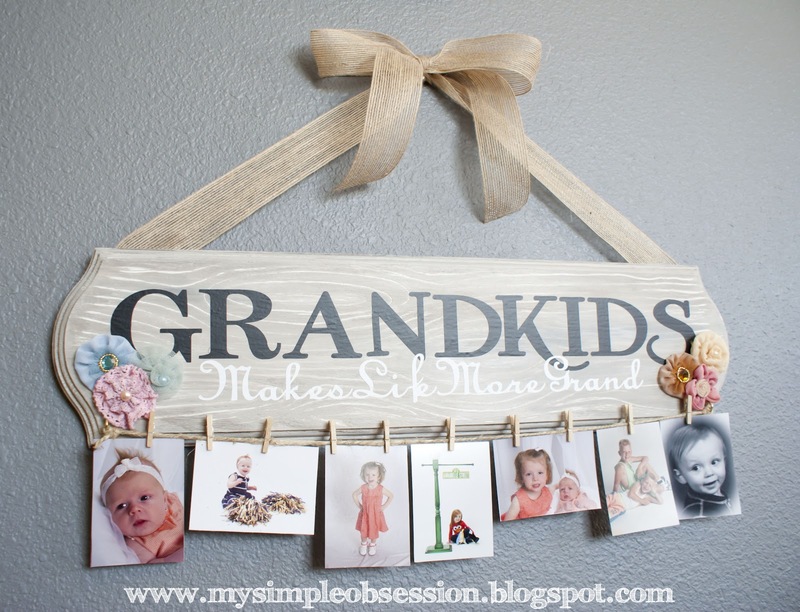 Is there anyway you can let me know what type of font I can use to make it look most like the GRANDKIDS and "make life more grand" if I'm just printing them off my computer? Thanks! 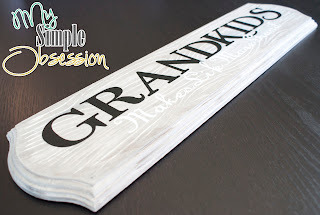 Is there any way you know what type of font I can use for the GRANDKIDS and "make life more grand" if I am just printing them off my computer? thanks so much for the detailed tutorial. I, myself lack the crafty bone and so I have a couple questions for you. Do you think you can just buy like sticker letters from Michaels and use those to create the saying? Also for the heavy brush technique, do you dip the brush in all three colors at the same time? Thanks so much for your help!!! Can you just use stickers for the letters, the ones you find at michaels? I don't have a cricut machine either. Next, for the heavy brush technique do you just dip the brush in all three colors at the same time? Sorry if these questions may sound ridiculous, I am just not a crafty person at all, but would love this sign to give to my mom and dad for xmas.... I am going to announce that we are having twins by clipping pics of the other grandkids and then putting the sonogram at the end with the two new little ones!!!! Excited, I just hope I can pull the crafty bone out of my body to accomplish this !!! Hi. :) I don't see why not. some stickers have a problem with adhering to wood. But I would stick them on when the paint is still curing. That way the stickers will have a better bond. I did one color at a time but never dip your brush in water!!! You want the brush to be dry. Putting it in water will dilute the paint making it glide on. I posted a link of the examples of dry brushing in a comment I believe. :) Happy holidays and congratulations! I apologize if a million of my comments are showing up. I cannot tell if its publishing the comment. What size letter do you recommend cutting or buying? I don't own a cricut machine so I am having someone make it for me. I have the same size plaque. What size lettering did you use? Is this a 24x6 plaque? Thank you for sharing your step by step instructions. This is a lovely addition to any home. 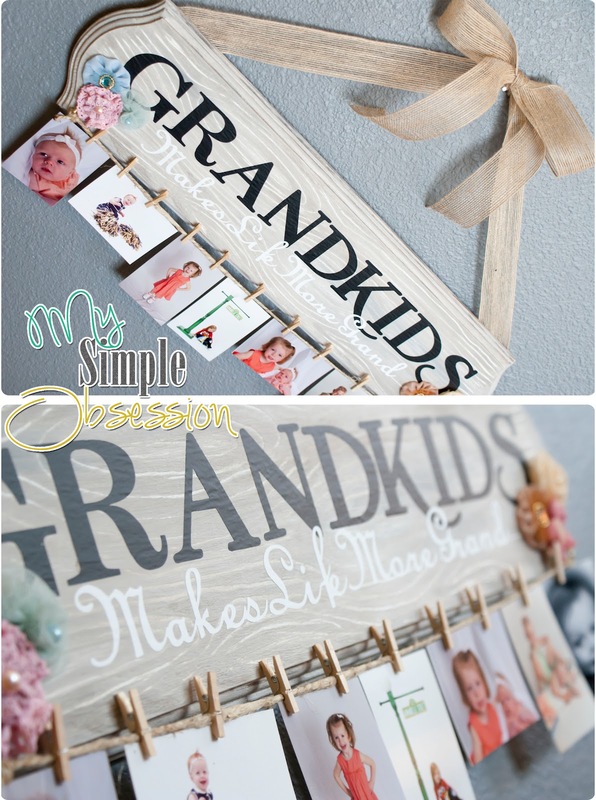 Also just wondering if you had to do the word 'Grandkids" and the saying in 2 pieces? They are about an inch tall. Can you share with me what font is used for the GRANDKIDS and "make life..." Please!! 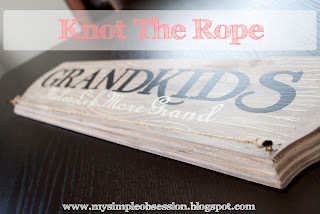 I am making a sign for my niece to hang her bows and I want to put her name on it. 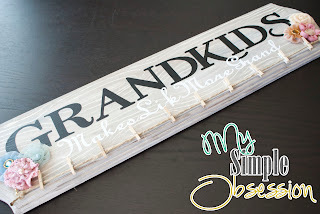 I love the K in the GRANKIDS font. Would you mind sharing the name of the font? I am in the process of making my own version of this after I stumbled across your idea on pintrest and fell in love with it. I bought my boards from Michael's, sanded them, treated them and stained them. I then cut my vinyl using my Cricut and Cricut vinyl and transfer tape. My vinyl will not stick to the wood. I've tried everything from pushing harder, to heating the vinyl with no luck. Are you using a different brand of vinyl? Have you ever done this using stained wood? I'm so upset this is not working out like planned. Please help if you can. Hi! I'm so sorry. I'm just reading your comment. 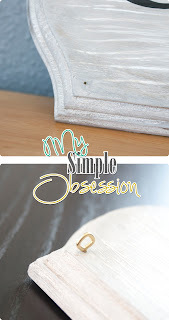 I used Cricut vinyl in this tutorial. For the signs in my shop, we use Outdoor vinyl. It is permanent. It is Oracal 651. I Believe Cricut is 631. However, You can still use Cricut. The trick with a stained board is you have to seal the stain in. I use a Matte Finish. It is a Spray can by Krylon. Just spray it over your boards and let it dry for about an hour and then vinyl it. :) Works every time. You have to seal on the Michaels boards because they are pine wood and the stain takes a few weeks to fully cure to the board. Please let me know if you have any other questions. Let me also know how it turns out. Will the Cricut vinyl Oracal 631 work just as well? After a few tries, I finally got the vinyl to stick. After applying a second coat of poly, I sanded, polyed a 3rd time and it finally stuck. I just saw your reply to my comment lol. It was a hit at Christmas time. Thank you so much for your reply. I will be using the Matte Finish if I decide to make this again. Im not sure if my last post posted. I plan on buying my board from Micheals, but I do not have a Circut. 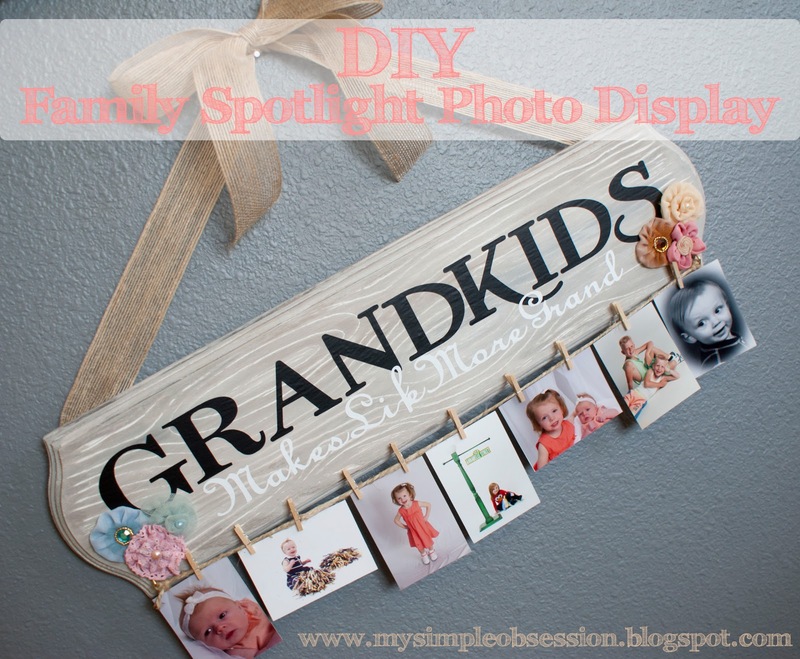 Do you have another option for someone who isn't so crafty and creative for what to use? I love this Idea, thanks for sharing! Maybe some stencils and some paint! May I ask could I poly over the vinyl or what other substance might you suggest to give it a finished look and to protect the letters from peeling? I use a Matte Finish. It is a Spray can by Krylon. Just spray it over your boards and let it dry for about an hour and then vinyl it. :) Your vinyl should never peel! The sign I made this tutorial for is still like new. :) putting any moisture over the vinyl wil cause it to peel. You have to treat them as if they are a sticker, but they do not peel unless picked at. Hi, I am currently using your tutorial to make a sign for my mother in law, the only problem I've come across is the eyelet screws. The only ones I can find are the round ones that aren't too nice, where did you get yours? In this tutorial I used some that came in a wall hanging set. I currently use the round ones for my signs we make and sell in the shop. :) the kit was an OOK brand. Hi There! Chelsea here from The Johnsons Plus Dog. Just wanted to pop you a quick note and let you know that this DIY was featured today on my blog for my DIY Handmade Christmas Gift Guide! I'd love for you to come take a look. Have a great day!! What is the fonts you used? Do you make and sell these? If so, how long does it take to get it? I would need it in a couple of weeks!